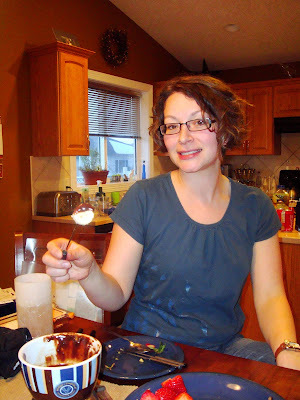 Scrapbook Savvy: Valentine's Day Fondue! We had a quiet night in for Valentines Day. Just the three of us and a fondue party! Brad was in charge of the hot rock, cooking our meats to perfection. I enjoyed the chocolate dessert fondue. Wait, that's all I can have? Don't want any of this chocolate to go to waste!